Exhibit A: a zucchini plant in a regular pot, watered every day and also nominally kept moist with some sort of a watering cone/spike thing. 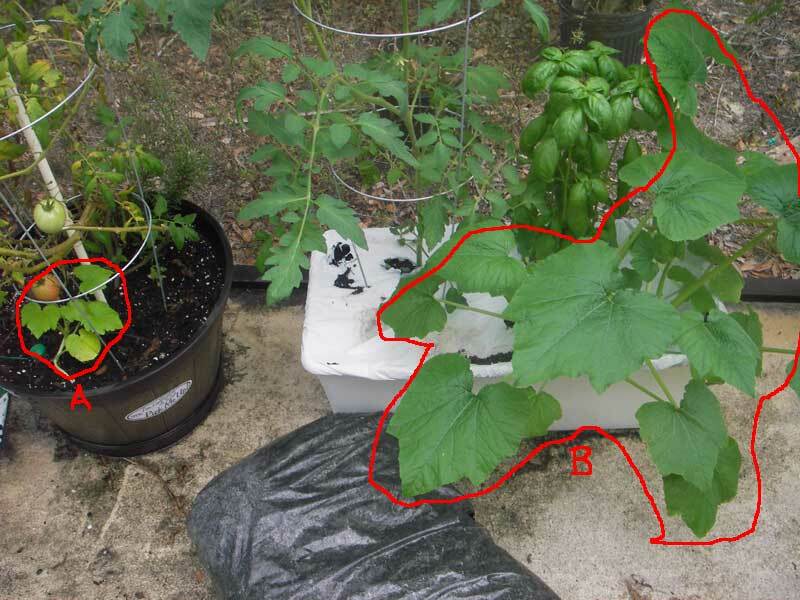 Exhibit B: three zucchini plants close together, in an Earthbox. Note also the giant basil behind zucchinis B. I've never seen a basil so big before. Also in both containers is a tomato plant - they're approximately the same size, but the tomato plant in the round container has been there for about three months longer. There's actually a basil in that other container too, that's been there as long as the tomato - it's never been more than about 6 inches tall with weak little leaves. It's in shot but you pretty much can't see it. Conclusion: Earthboxes are pretty good. I've also made a makeshift mini-earthbox for herbs, using a window box - it came with a sub-floor water tray already, so I just drilled some bigger holes through to the tray to make dirt-wicks possible, and a hole for a refilling pipe (the Earthbox's refill pipe is hidden under zucchini leaves), cut a piece of pipe to length and a side-hole in it at the bottom. It appears to work well - we got some "dying herbs, 50 cents" and a week later they're twice as tall, and the oregano's even growing flowers. So making your own Earthbox is certainly feasible, but I would recommend buying one to use as a model. If pigs can fly, imagine what a terrorist could do with pigs!